In the 26 centuries since the life of the Buddha, Buddhism has developed into diverse schools and sects. 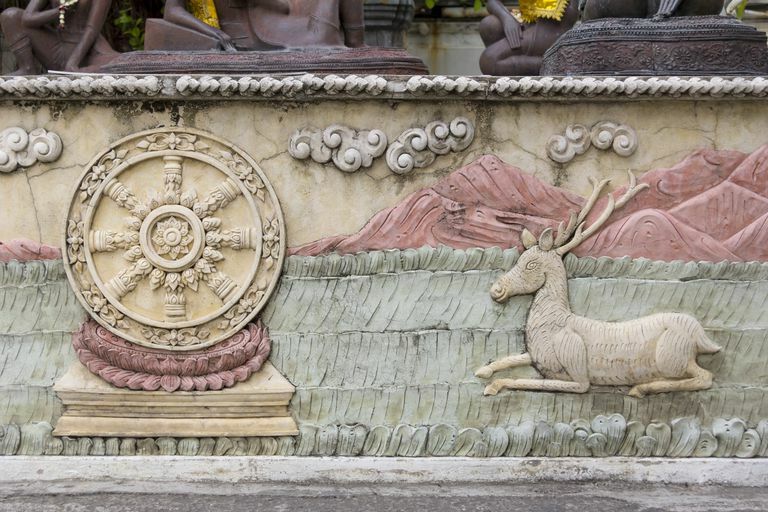 As Buddhism reached into new regions of Asia it often absorbed remnants of older regional religions. Many local "folk Buddhisms" sprang up that adopted the Buddha and the many iconic figures of Buddhist art and literature as gods, without regard to their original meaning. Sometimes new religions sprang up that were Buddhist in appearance but which retained little of the Buddha's teachings. On the other hand, sometimes new schools of Buddhism arose that approached the teachings in fresh and robust new ways, to the disapproval of traditionalists. Questions arose -- what is it that distinguishes Buddhism as a distinctive religion? When is "Buddhism" actually Buddhism? Those schools of Buddhism based on the Buddha's teachings accept the Four Seals of Dharma as the distinction between true Buddhism and "sorta looks like Buddhism." Further, a teaching that contradicts any of the Four Seals is not a true Buddhist teaching. All stained emotions are painful. Anything that is assembled of other things will come apart -- a toaster, a building, a mountain, a person. The timetables may vary -- certainly, a mountain may remain a mountain for 10,000 years. But even 10,000 years is not "always." The fact is that the world around us, which seems solid and fixed, is in a state of perpetual flux. Well, of course, you may say. Why is this so important to Buddhism? Thich Nhat Hanh wrote that impermanence makes all things possible. Because everything changes, there are seeds and flowers, children and grandchildren. A static world would be a dead one. Mindfulness of impermanence leads us to the teaching of dependent origination. All the compounded things are part of a limitless web of interconnection that is constantly changing. Phenomena become because of conditions created by other phenomena. Elements assemble and dissipate and re-assemble. Nothing is separate from everything else. Finally, being mindful of the impermanence of all compounded things, including ourselves, helps us accept loss, old age, and death. This may seem pessimistic, but it is realistic. There will be loss, old age, and death whether we accept them or not. His Holiness the Dalai Lama translated this seal "all contaminated phenomena are of the nature of suffering." The word "stained" or "contaminated" refers to actions, emotions, and thoughts conditioned by selfish attachment, or by hate, greed and ignorance. "All emotions are pain. All of them! Why? Because they involve dualism. This is a big subject now. This we have to discuss for a while. From the Buddhist point of view, as long as there is a subject and object, as long as there is a separation between subject and object, as long as you divorce them so to speak, as long as you think they are independent and then function as subject and object, that is an emotion, which includes everything, almost every thought that we have." It is because we see ourselves as separate from other things that we desire them, or are repulsed by them. This is the teaching of the Second Noble Truth, which teaches that the cause of suffering is craving or thirst (tanha). Because we divide the world into subject and object, me and everything else, we continually grasp for things we think are separate from ourselves to make us happy. But nothing ever satisfies us for long. Another way to say this is that nothing has intrinsic or inherent existence, including ourselves. This relates to the teaching of anatman, also called anatta. Mahayana Buddhism teaches the doctrine of shunyata, or "emptiness." Phenomena have no existence of their own and are empty of a permanent self. In shunyata, there is neither reality not not-reality; only relativity. However, shunyata also is an absolute reality that is all things and beings, unmanifested. Dzongsar Khyentse Rinpoche said, "In many philosophies or religions, the final goal is something that you can hold on to and keep. The final goal is the only thing that truly exists. But nirvana is not fabricated, so it is not something to be held on to. It is referred to as 'beyond extremes.'" Nirvana is defined in diverse ways by the various schools of Buddhism. But the Buddha taught that Nirvana was beyond human conceptualization or imagination, and discouraged his students from wasting time in speculations about Nirvana. The Four Seals reveal what is unique about Buddhism among all the world's religions. Dzongsar Khyentse Rinpoche said, "Whoever holds these four [seals], in their heart, or in their head, and contemplates them, is a Buddhist."